Here are some answers to some of the more common questions that people ask about podcasting, along with some information on what you will need if you would like to start producing podcasts yourself. A podcast is a digital recording of a radio broadcast or similar program, made available on the Internet for downloading to a personal audio player. Nowadays the term Podcast is also sometimes being used to describe Video downloads – or what people also call ‘Videocasts’ or ‘Video blogging’. Audio podcasts are usually MP3 files. If you would like a more detailed explanation of what podcasting is, along with some Frequently Asked Questions about Podcasting – we recommend you look at the BBC Radio’s Podcast Basics pages. Why is podcasting becoming so popular? Cost – it can be extremely cheap to produce podcasts, all you need is a microphone, a sound card in your computer and some freely available audio editing software to edit your show. In short this means that almost anyone with access to a computer can start producing podcasts. Subscription – You can subscribe to podcasts easily by using free software on your computer, like Apple’s Itunes. This means there is no risk of missing an episode and you are automatically notified when a new episode has been released. What equipment do we use to make our podcasts? Soundprofessionals.com is a great source of professional sound equipment that we’ve used for a couple of purchases in the past. We wanted to be able to record easily ‘on the move’ so did alot of research and decided that one of the Iriver IFP 7xx or 8xx series MP3 players was the best option for this. 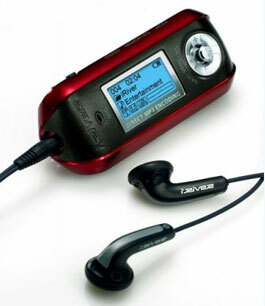 Specifically we use an Iriver IFP899 (pictured right). Unfortunately, Iriver discontinued making these a while back, and I had to buy mine used from the Amazon Marketplace (if you want to look for one, just search for Iriver ifp on Amazon as there are a few different models with different amounts of memory – do make sure it is a 7xx or 8xx series though). The 899 has 1GB which is far more than is necessary. 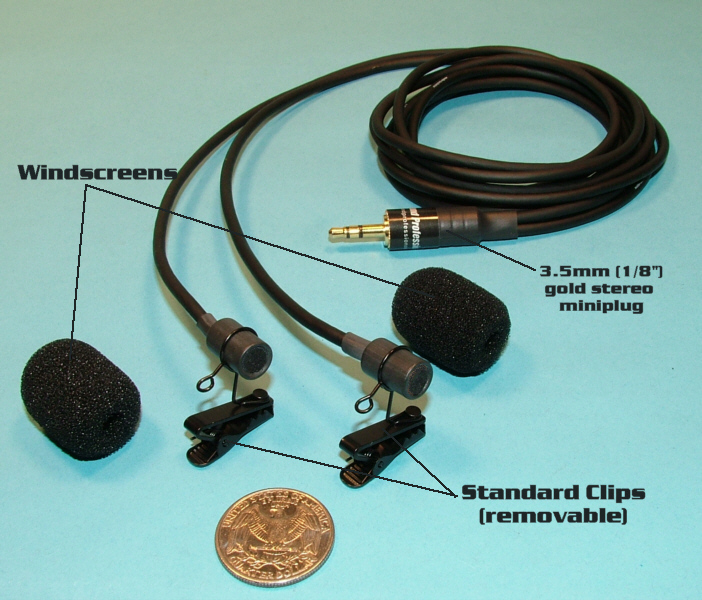 We use stereo binaural lapel microphones from Soundprofessionals.com, which cost about $100 although you could definitely get away with something a bit simpler, and even use the built in mic on a hand-held dictaphone or MP3 player/recorder to get started. We use a Sony Vaio laptop and Adobe Audition to edit the recordings we have made and upload them to the internet. Adobe Audition costs money, but is worth the expense as far as we are concerned – at the time of writing it is up to version 3. There is however another free program called Audacity that is also very popular with beginner podcasters. Where do we host the podcasts? When we have finished making a podcast, it needs to be uploaded to a computer (server) on the internet so people can access it. We use a company called Libsyn to ‘host’ (store) our podcasts. You could produce and publish podcasts through Libsyn without having another website, as they automatically create a little website for you when you open an account (here’s ours). Their basic account costs $5 a month and allows you to upload up to 100MB of audio a month. As they say, this is approximately equivalent to a daily 20-minute talk program, encoded in low-quality, a weekly 30-minute mixed talk-music program or a weekly 20-minute high quality music program. New recommended portable stereo recorder released! 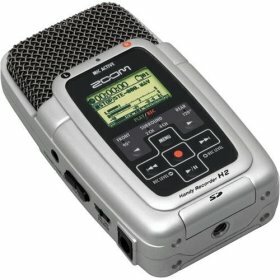 Up until recently there were very few other options in the same price range for amateur podcasting as the Iriver IFP series, but in October 2007 the Zoom H2 Portable Recorder was released. It costs about $200 and I’m already kicking myself that I didn’t wait and buy one. The podcast forums are raving about it, and a further advantage is that it has an exceptionally high quality built-in stereo microphone so you don’t need to buy extra mics.